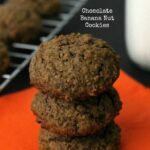 Chocolate Banana Nut Cookies combines three great flavors into one delicious cookie! In mixer add butter and sugar. Mix till creamy. Add egg, banana and olive oil and mix till creamy. In separate bowl combine oat flour, all purpose flour, baking soda and cocoa. Using two tablespoons (or cookie scoop) scoop out mixture and drop onto cookie sheets. Bake for 9 minutes or until golden brown. Cool and ENJOY! No need to buy oat flour. I took one cup of quick oats and pulsed them in my food processor to make my oat flour!